This entry was posted on Thursday, June 9th, 2011 at 9:29 am	and is filed under Other. You can follow any comments to this entry through the RSS 2.0 feed. Both comments and pings are currently closed. Hrm. That looks a lot more alarming than it should, IMHO. It just means that while you are accessing my site via https://, some elements are not loading in https, such as the ads on my site. you can load the same page via http:// and you won’t see that warning. Marie — Due to a temporary change on the server side, incoming requests for krebsonsecurity.com were momentarily transferred over to https:// connections. That should no longer be the case. So thinking about this for a minute, is there any evidence that these folks might also be trying to inflitrate or compromise the various services that offer to set up (remove trialware, install other software) new PCs for novice users? there are some ppi companies which hijack the ads on webpages and replace them with their own, the installer then gets a share of the profits that are made from the victim clicking the ads. never been a great fan of ppi myself. a few of them go onto sell the installs themselves which are usally already full of crap anyway. what do you make of gangsta bucks, iv seen them advertise on a few forums and they dont really look all that appealing to be honest. I agree Brian, the current strategy to fight botnets isn’t working, and won’t work in the long run. I can’t propose anything better, though. 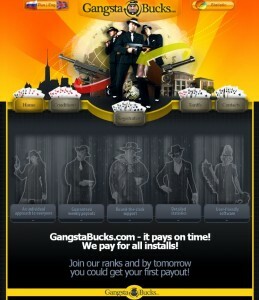 Gangsta bucks, the site you have mentioned in the blog post doesn’t seems to exist or i might not tried rigorously on Google to get its actual U.R.L. Gangstabucks was closed some time ago, it has been kind of the only PPI Site that was publicy available (everyone could get in) now it’s all a bit back more to private. I can give you a list of some “Private” PPI providers, if you would like to take a look at some. IRTA krb on security. lulz. If banks required you to type in a code text messaged to your mobile phone upon login (much like Chase does), and then again upon any sort of transfer or action that involves moving money around, wouldn’t that stop this sort of crime? Where / how do you find that 7 bucks for install on 1000 computers? As a security person I am very curious.